so the food of the week, or rather the beverage of the week is tea!i am a tea lover year round but in the summer i find myself drinking even more of it. hot or cold, i will always take some tea! not to mention there are numerous benefits from drinking this luscious treat. in the summer i make a lot of sun tea and i frequently order it out and about. or the second: individual serving take a few mason jars, fill with water. then add two tea bags to one mason jar. then place a few slices of lemon and sprigs of mint. set outside for a few hours to allow to steep! if you are looking for a quick on the go tea solution i love starbucks tea options! my favorite tea beverage is a half passion tea (herbal) half green tea mix. its delicious! I LOVE tea! 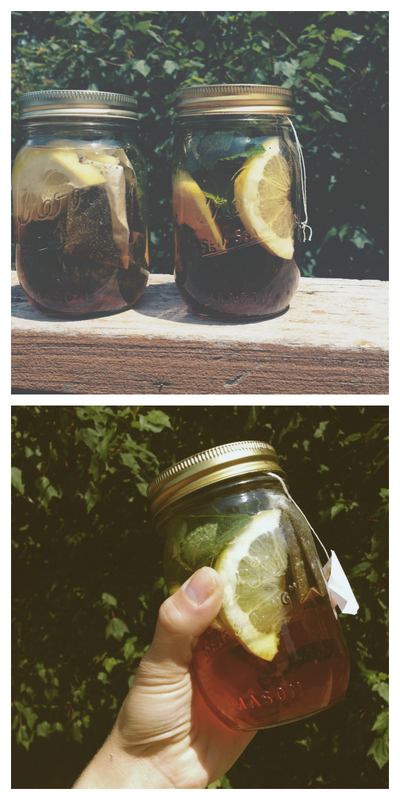 i used to make sun tea every summer :) maybe i should do this again. it's so much fun. also--was reading your last post--you do NOT look like a mom! not that looking like a mom is a bad thing, but i know what you mean haha ;) i personally loved your outfit! so is sun tea allowed in portland too? or is just a midwest / south thing? I've never heard of steeping tea in the sun. I'll have to try it, as I'm an avid tea drinker! Also, I've never tried Passion Green tea at Starbucks. I'll have to try that too!